DJ 19 & THOMAS PENTON are at it again with a brand spanking new track entitled "3 A.M. Delightful" on 19BOX. The duo have already partnered together to make the track "Ima" and produced JAFROSAX's anthemic house tune "SAXTATIC”. With “3 A.M. Delightful” the duo take on the Japanese vocal and give it the same preferential treatment that "IMA" had in the past. Their original version is destined to become another captivating, driving and energetic progressive affair for those who like it techy and sultry. The flip side sees MOHAWK on remix duties. His take on “3 A.M. Delightful” is a more peak time house affair that explores electro and trance vibes. MOHAWK is the guise for MO VOLANS. Since he started this project he has signed projects to BAROQUE, FRAGILE, SUBVERSIVE and SYSTEM. MOHAWK remixes have already appeared on CURVVE, SOMATIC SENSE, POSITIVA (THE SHAPESHIFTERS) and TWISTED FREQUENCY. MO VOLANS’ portfolio spans over a decade and there aren’t many labels of note that he hasn’t worked with. Some of his previous aliases include: OPENAIR, MOHAWK, MO AND SKINNY and TWISTED AIR. This is 3 A.M. Delightful. This is what you dance to at night. Out on October 31st through 19BOX. DJ 19 & THOMAS PENTON are at it again with a brand spanking new track entitled "3 A.M. Delightful" on 19BOX. The duo have already partnered together to make the track "Ima" and produced JAFROSAX's anthemic house tune "SAXTATIC”. With “3 A.M. Delightful” the duo take on the Japanese vocal and give it the same preferential treatment that "IMA" had in the past. The flip side sees MOHAWK on remix duties. His take on “3 A.M. Delightful” is a more peak time house affair that explores electro and trance vibes. This is 3 A.M. Delightful. This is what you dance to at night. Out on October 31st through 19BOX. Tracklist of "SUPE 002" is below. Out on September 29th. DJ 19 and STEVE MAY team up for the 26th release on 19BOX RECORDINGS. "AI" which means “Love” in Japanese is the result of that studio connection and is a trancey progressive house number that peaks with a massive synth line that's underlayed with rock undertones. Tribal duo from Argentina, LONDON 909 dish out a masterpiece of tribal progressive that creates a massive result! Available exclusively at Beatport on Sep 30th. 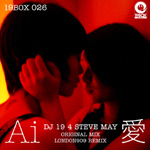 DJ 19 4 STEVE MAY is the hybrid brainchild of Tokyo based producer DJ 19 & Melbourne based producer STEVE MAY. MAY has released tracks through many well known labels EQ (GREY), BAROQUE, AVA and FIVE AM since he was 20. In 2005, DJ 19 invited STEVE to his legendary party "PARK" entitled "PARK - May I Dance With U?". Through that invitation, they both discovered and shared similar influences in club music. As a result of this instant connection, they discovered that they clicked in the studio right away. "AI" which means “Love” in Japanese is the result of that studio connection and is a trancey progressive house number that peaks with a massive synth line that's underlayed with rock undertones. Tribal duo from Argentina, LONDON 909 dish out a masterpiece of tribal progressive that creates a massive result! LONDON 909 were SERGIO SAUCHELLI & ADRIAN LA CIVITA. Under this name, they released tracks on labels such as YOSHITOSHI, LOW PRESSINGS, DISTRAEKT RECORDS, SHAKES RECORDS and SOLAR. Their well-known remix BOB SINCLAIR's ''Rock This Party'' sold over 200 thousand copies and firmly established them as producers to watch. Previous DVDs of the glamour model/bikini model genre have used cheap background music. 19BOX RECORDINGS set out to change that and is now working in cooperation with the new DVD label, DIFFER. Each DVD release will feature a different model. This unique and innovative partnership allows you to hear 19BOX RECORDINGS’ tracks before their actual release date.